The Menorah is one of the keilim (vessels) in the Beit HaMikdash (Temple) whose lamps are lit daily as part of the avodah (service). The Menorah is found in the southeastern corner of the Kodesh (Holy) [in the Heichal (Sanctuary)]. 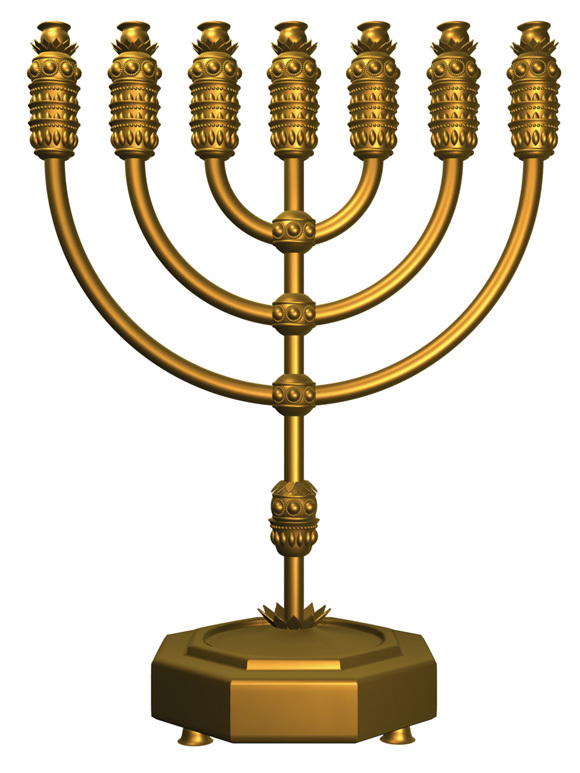 Structure: The Menorah has a main branch with seven branches coming off of it- each topped with a lamp, branching off from the main branch. The entire structure stands on a base with three legs. Although the Menorah can be made out of any type of metal (such as the iron Menorah constructed by the Chashmonaim (Hasmoneans) during the story of Chanukah), if the Menorah is made of gold it must be decorated with three types of decorations- Gvi’im (goblets), Kaftorim (knobs) and Prachim (flowers), weigh a kikar (talent-equal to 75 lbs. ), and be made of one solid piece of gold. See Hadlakat HaNerot (Lighting the Menorah) and Hatavat HaNerot (Cleaning the Menorah) for more information.